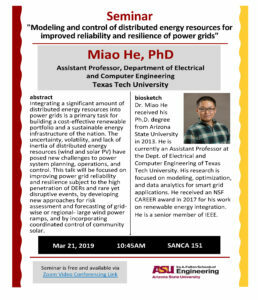 Please join Miao He, assistant professor, Texas Tech University for the seminar, “Modeling and control of distributed energy resources for improved reliability and resilience of power grids,” on Thursday, March 21, 2019! Integrating a significant amount of distributed energy resources into power grids is a primary task for building a cost-effective renewable portfolio and a sustainable energy infrastructure of the nation. The uncertainty, volatility, and lack of inertia of distributed energy resources (wind and solar PV) have posed new challenges to power system planning, operations, and control. This talk will be focused on improving power grid reliability and resilience subject to the high penetration of DERs and rare yet disruptive events, by developing new approaches for risk assessment and forecasting of grid-wise or regional- large wind power ramps, and by incorporating coordinated control of community solar. Miao He received his Phd degree from Arizona State University in 2013. He is currently an Assistant Professor at the Dept. of Electrical and Computer Engineering of Texas Tech University. His research is focused on modeling, optimization, and data analytics for smart grid applications. He received an NSF CAREER award in 2017 for his work on renewable energy integration. He is a senior member of IEEE.